Recently, I drew a guest comic for Ulf Salzmann’s “Flausen” blog. Here it is. 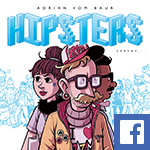 It doesn’t feature any hipsters, but one of the monsters from “Hipsters Vs. Monsters”, my very first Hipsters comic, which is currently unavailable. I am however about to finish translating it into English and am going to put it on the site in the next couple of days. Meanwhile, check out this neat video on the Evolution of the Hipster!